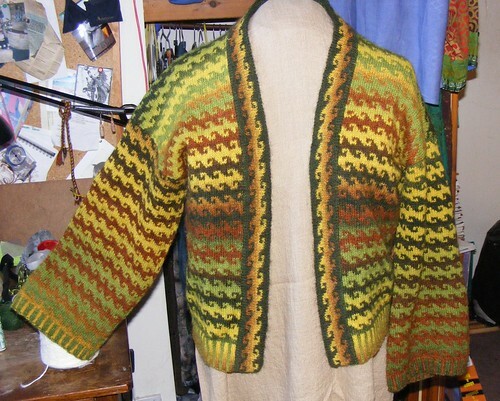 Must remember to vaguely write down what I did with this before it's donated at Woolfest. I don't really want to knit another just to remember how I did it. That's it - I'm done! The last lot of preparation for Woolfest - drumcarded batts: nine of Sockstuff in various colours, one BFL and silk and one alpaca and silk. There's about three hours work here, and it's been humid and thundery here this afternoon. Poor Bil kept trying to hide under my legs and ended up tripping me. Weigh out over 100g of dyed sockstuff bits - this is the last of the broken tops in superwash wool/nylon 80/20. 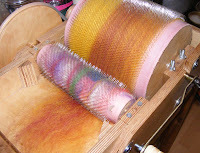 First loading of the carder - this is my new Hedgehog one, and I can make much bigger batts much more easily. Lovely machine! This is what the green and yellow looks like after one pass. This is after the second pass - as it will be split again for the final loading of the carder, this is sufficiently blended. First pass of the second colour blend. Second pass; look how quickly the colours blend. Three batts ready to make the final ones. 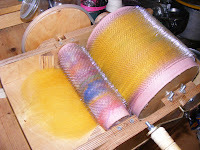 I spread a third of the yellow batt across the whole width of the drum. The orange is then loaded across one half, over the yellow. Then the green over the other half. Batt pulled off and rolled up with the yellow to the inside. 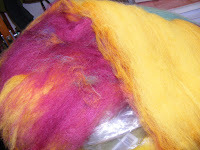 I then make three more (which is where the new carder comes in, the other two will only manage four batts to 100g, this one can split it into three! ), roll them neatly and put them in a cellophane bag. Neatly label, price, and add to the Woolfest pile. 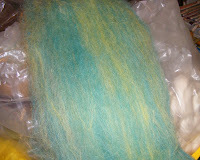 This is the last but one lot of dyeing, I hope. Boucle, dk, lace and 4ply, in various colours. Nearly dry enough to reskein. 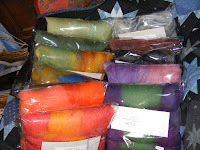 The sockstuff fibre was done this afternoon - a pot each of blues, greens, oranges, yellows, and purply reds. They'll all be drumcarded up by the weekend. 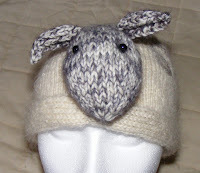 I've made another sheep cap. This is in a lovely soft natural grey Polwarth, in a slightly less stiff fabric. Brushed mohair for the embroidered spirals and the topknot. I rather love the face on this one. You can't see her tail, but it's a bit better than the tail on the first one, which will be surgically removed and replaced with a different one this evening. I'm planning to annoy Mark by packing fibre into cellophane bags all evening. It makes a horrible rustling noise, and if the window has to be open due to warm evening and drying fibre, the television will have to be at a deafening volume to hear anything at all. I think the end's in sight. Off to turn over roast chicken over (new idea, it's stuffed with black pudding so I'll be interested to see if it works), chop up new potatoes for sauteeing, and shred a salad. Sounds almost healthy doesn't it. 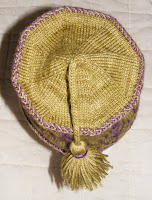 Having quiet hat frenzy here, amidst all the dyeing. I've rather enjoying having a couple of small projects on the go instead of carting Mark's Orkney gansey about on the train. I've done this particular style a few times before, but don't seem to hang on to them well. This one is for me - that's the theory anyway. View from the side. I rather like this pattern, although I can't decide whether it's a candelabra, tree, fern or feather. Any ideas? 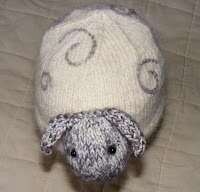 Well, I've got at least one sheep done for the Sheep Auction at Woolfest this year. Being me, it's not just a sheep. 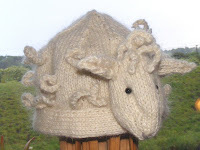 Mark has actually rather admired it and indicated he would wear one - I shall take him at his word, because once I'd worked out the head and tail it didn't take at all long. The tail may change, though. I used a brushed mohair yarn alongside a cream aran to get a lovely halo on the fabric, though that's not necessary. It doesn't actually look too silly once it's on. I think. are not ready for photographing yet. 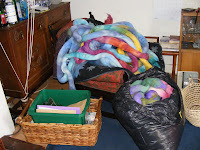 I have done 800g of Solstice, 400g each of Mordred, Skyblue and Nacre (a new one that I rather like) and three huge vats full of fleece, the last two of which are still simmering and one of which (in yellows, turquoises and purples) is draped up drying. I've had enough now and my hip's hurting from standing up too long. Mark'll be back shortly from walling, so while he's soaking in a bath I shall make a salad to go with the garlic and mustard roasted chicken (which I've just prepared and is now ready to chuck in the oven) and chips. I've half a bottle of white wine left from last night. Any my favourite programme of the week - "You've Been Framed" - is on at 6pm. Can we say schadenfreude....? 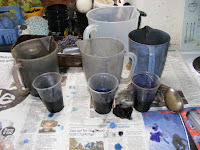 Dye stock solution, measured out and waiting to be diluted. I do two lots of 200g fibre at once - the stuff in the jugs is the first lot; once that's used I transfer the stuff in the little plastic glasses to the jugs and use that. 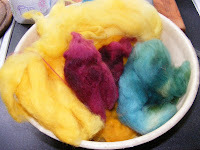 Soaked and spun out fibre (in this case superfine merino) waiting in its fishkettle, with dye solution ready to be poured on. 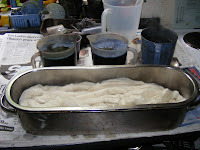 This is the second lot of the day, so the water's already been through one dyeing session and is just off boiling. 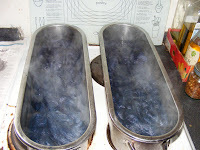 Fishkettles full of fibre and dye and sitting on the hob, simmering away. The first lot always takes longer as the water is cold to start off with. This won't be long at all. 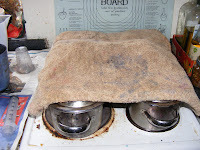 Kettle lids on and a dyeing towel over the top to provide a small amount of insulation. Have to be careful here after I was dyeing in a hurry, had the rings on full (usually only on lowest setting) and set the towel on fire when I wasn't in the kitchen. The burning towel then set the wheelie bin outside on fire. Not a good morning. When I say I dye to exhaustion, I do mean it. This is the water being spun from the first lot of the day, and as you can see it's practically clear. 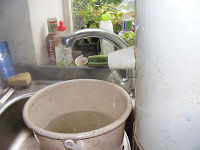 It means I can use the same water again and again, using less energy as it needs less heating up, and less vinegar/citric acid as it is only slowly drawn from the water by the fibre. The first lot of today's fibre (this is Solstice, and is darker than it looks) hanging up to dry. This is the old Landrover's dog rack balanced between the bookshelves and the stairs - it makes a good drying frame, even in today's cold and miserable weather. When it's full I'll start using the creel in the sitting room, as I'm up to date with laundry. Stuff to pack up this morning, if I have enough labels. There's rather a lot here, and vast amounts more on the storage shelves in my bedroom. But I still don't have enough for Woolfest, I think. I've just started on the 10K bump of superfine merino, and need to pop up to Adelaide Walker's in Otley next week for camel/silk (I've at least one order for this stuff in golds) and some more coloured BFL. 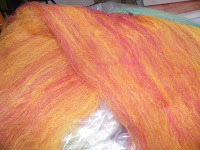 And, if I've enough money left after this, some of their lovely, lovely merino /silk. 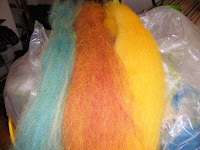 This dyes to incredible metallic colours, but as it's an expensive fibre it's even more expensive when I've dyed it up. 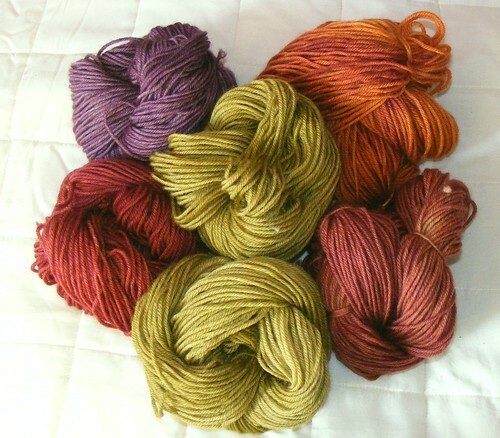 Not my usual colours, though the two in the middle are greener in real life - I took this photograph in evening sunlight and it's shifted the colours a bit. This is my next hat project, and after a bit of knitting last night and this morning the inner facing and first twined braid are done. 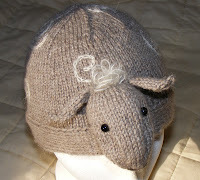 I feel a sudden need to knit more hat/s for this, which was emailed to me the other day. As if I don't really have enough on with Woolfest in three weeks. No dyeing yesterday or, I feel, this afternoon. But I'm in on my own tomorrow (Mark's walling) so there is no excuse for not having pots bubbling all day. Finally got around to photographing this properly, over a week since I finished and wore it for the first time. I was photographing a couple of bits of sewing on the model, and then wondered why I'd not thought of using it for knitting as well. I'm really please with how this jacket came out - the colours have slotted together perfectly. I don't think that the combination has duplicated at any point in the whole garment, the colours have shifted so much with each repetition. Of course, it's not surprising that I've got the construction nailed after three goes. I have a few ideas as to doing something else with this Kauni yarn, but heaven knows when! I have so many other ideas for so many other things, not to mention a job and the dogs to walk.